When it comes to instrumental music, it’s sometimes seen as a niche market. The type of thing that only appeals to other guitar players/musicians. While some have had some wider success, the usual emphasis on shred above all tends to skew things towards the direction of fellow players instead of the general public. What works best on Follow the Light is that the technique is there, but it’s surrounded by a cinematic scope that makes it easy for anyone to get into. Of course, it helps that Follow the Light is written as a conceptual piece (with the added attention to detail of an accompanying short story), but there is a soundtrack-quality residing in the music itself. Sweeping orchestral/symphonic arrangements that lift the material into something that’s easier to take in and process, as opposed to an ordinary guitar-fest. The often clichéd statement of the album feeling like a journey does indeed apply here, again due to the fact that the guitar melodies and leads feel more organic and natural surrounded by the augmented feel of the arrangements. But that’s not to say that Dadaian can’t shred with precision and entertainment value. Songs like “Red River” and “Presence of Mind” demonstrate some savvy guitarwork that can fit in with the top of the class without ever feeling to ‘showboat-y.’ There’s a great combination of more accessible melodies woven in to the over-the-top shredding that is needed in a release like this. As an added bonus, around the half-way mark sits the album’s only vocals in “Soul Connection,” which are brought to you by Soilwork’s Bjorn Strid, serving as a nice way to break up the album as well. 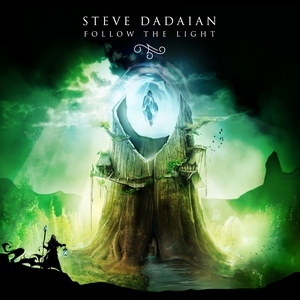 It’s all about the incorporation of masterful guitar shredding and accompanying arrangements on Follow the Light, and Steve Dadaian manages to nail them both. Plenty of guitar wizardy, but never at the expense of the song itself, along with a good variety of tracks make for an instrumental album that should have no problems finding a wider audience than the norm.